Bill Driber (left) filmed the Slayer mosh pit with help from recordist Jeff Lotierzo. You know NFL Films from decades of America’s Game, Football Follies, Hard Knocks and slow motion close-ups of the NFL’s most exciting moments. What you may not know is that the Vault at 1 Sabol Way also contains some of the 70s and 80s most popular concert and music videos, which were produced by Sabol’s Army. A willingness to take creative risks, along with its well-known penchant for cinematic story telling, helped foster NFL Films little known foray into the world of rock and roll. It all began when a friend of Steve Sabol helped connect his producers to Steve Barnett, a music executive and current president of Capitol Music Group. Before it ended, the journey of America’s Football Movie Makers included work with Kiss, The Black Crowes, Slayer, Def Leppard, Foreigner, and, well, Journey. Bill Driber, a longtime Films cinematographer and presently the company’s Head of Production Operations, shot many of these concerts and the music videos that grew out of them. One of his most memorable tales took place in Mesa, Arizona at a Slayer concert. Credited as one of the ‘Big Four’ thrash metal bands, Slayer inspired serious devotion from its fan base, which Driber would experience first-hand. Moshing is a style of “dancing” that was common at heavy metal concerts in the 80s and 90s. It involves a large group of people following each other in a circle, violently thrashing around — a football game without referees…or rules. The mosh pit at the Slayer show in Mesa promised to be 6,000 strong. Driber enthusiastically volunteered to film the action on the front lines, where he’d be escorted by two strongarm members of the Films crew, whom Driber blithely calls his goons. 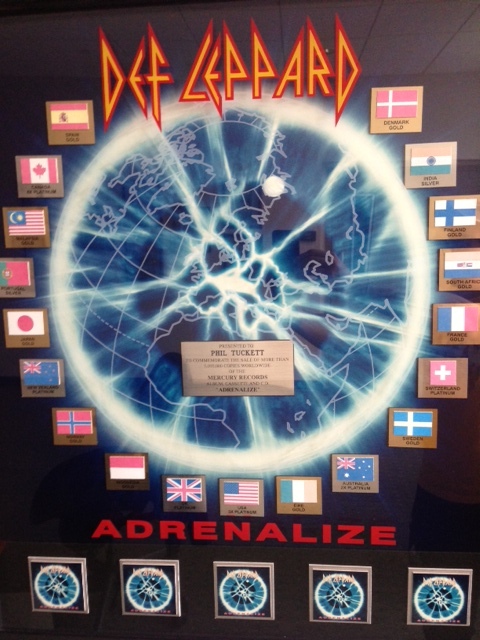 A plaque presented to Director Phil Tuckett to commemorate the sale of more than 5,000,000 copies of the album “Adrenalize”. The morning of the concert Driber and his bodyguards were required to take a self-defense class to learn how to protect themselves from unruly “moshers”. “The instructor told us if you get picked up and are passed around make sure you roll onto your back, because there’s people with screwdrivers and knives that will try to stick you, and there’s more vital organs around your stomach. Now at this point we’re like, ‘Do we really want to do this?’” says Driber. The helmet and camera rig Driber wore in the mosh pit, where it remains on display in the NFL Films Camera Department. The production of these videos was a long, complicated process. Before the show went on, while the venue was still empty, the film crew would get all its close-ups and set-up shots on the same stage where the concert would eventually take place. Depending on the band, these shots would be captured the day before the concert or hours prior to it. The band members would have to be sprayed down with water to mimic sweat, and would wear the same clothing in which they’d later perform the show. Driber’s experience in the throes of the mosh pit was an exceptionally strenuous one when it came to Films rock shoots, which according to Director of Cinematography Hank McElwee, were generally less tiring than shooting pro football games. “[At a concert] you’re pretty much in one spot,” says McElwee, “whereas in football you’re running up and down the field. 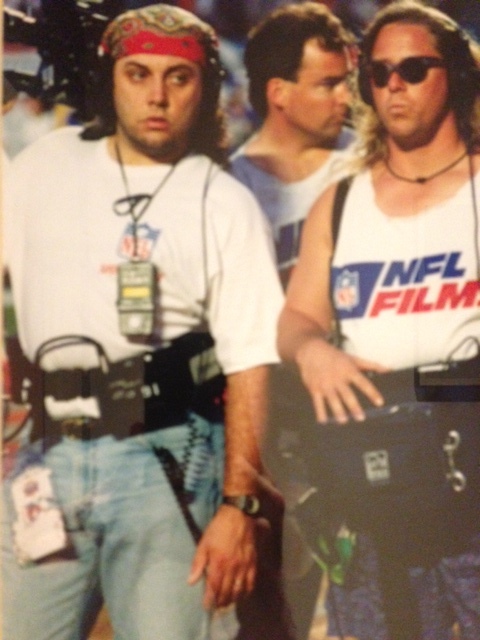 Shooting a football game is more physical.” But not unlike capturing the NFL, dramatizing a rock song had its own unique challenges – which the Films crew learned firsthand while embedded with Journey’s “Frontiers” tour. 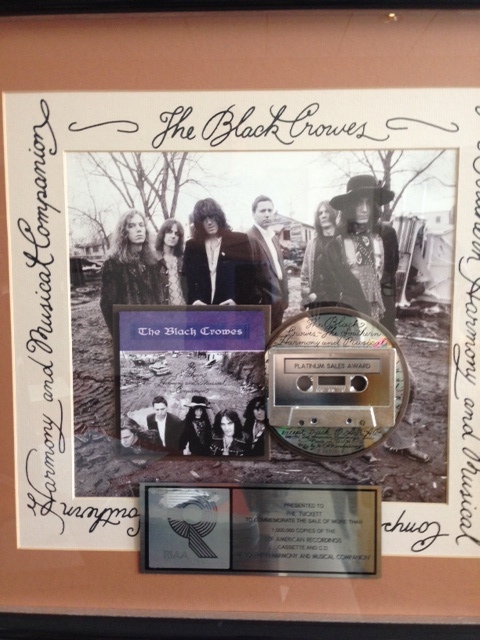 This plaque that hangs in the NFL Films Audio department was presented to the company by the Black Crowes, to commemorate the sale of more than 1,000,000 copies of the album “The Southern Harmony and Musical Companion”. When shooting began for the music video for the song “Faithfully”, Journey’s lead singer Steve Perry had a moustache. Then one day during the tour, he showed up without it. To solve the continuity issue prompted by Perry’s smooth upper lip, director Phil Tuckett shot a scene for the middle of the video in which the Journey front man—his face lathered with shaving cream—“shaved” off the mustache that was already gone (Check out the music video HERE, from 2:06-2:15, to see the scene). The mid-stream adjustment – like the gameplan changes of a head coach in a halftime locker room – helped save the story, and the project. NFL Films occasionally still produces non-football features and spots, but the company abandoned music video work years ago, after learning the hard way that in real life, as in rock’n’roll legend, the band often fails to pick up the check. Still, few who were a part of it for NFL Films would dispute that the stories that grew from the company’s unforgettable back stage experiences in music were worth far more than the price of admission.